Having played extreme metal for many years, Frank Murphy decided to start this as a side project to express his other musical leanings. After not being in a band for 3 years, Frank has put his main focus on Morktra. Morktra is an ever evolving sound with a basis in the acoustic guitar. The lyrics are deeply personal and laden with despair and solitude with yet a glimmer of hope. Frank is setting no limits on this project and has released an album on January 6 2015 entitled “Tales From a Deathless Tree”. The “I’m Still Here” Demo was released on December 2015, and album “Contemplation’s Of The Void” was released on January of 2017. Frank released another full length album entitled “In The Earth I Will Be Free” on April 19 2018 and and another release “Live Looper Sessions Volume 1” in August 2018. Frank is a prolific writer so album number 5 is also pretty much done but will not be released until closer to the end of 2018. Bio: Davood Faramarzi, also known as DavidFar on Steemit, was born the year 1990 in Dargaz, Iran. He is a singer/songwriter and music producer whose genres of interest widely span the musical realms of Electronic, Classical, Pop, Alternative Rock and Metal. He has produced cinematic soundtracks as well as songs in many other varying genres. When he began playing music many years ago, his instrument of choice was guitar, which he continues to use as the main feature in much of his music today. He began recording his first rock music with a highschool friend from his home city of Dargaz, Iran around the age of 16. He regulary contributes original work to the live openmic contest on Steemit, where he continues to grow friendships and find many great and useful creative connections. Most recently, he has taken advantage of this opportunity by experimenting through collaborations with other Steemit artists. One of which is the new band called Azarakhsh created with his close friend, Morktra. He has also recently released a new single through Circle of Death Records entitled Circle which is a song exploring the existential ideas surrounding the repetitious cyclical nature of life and the undying nature of familial love. 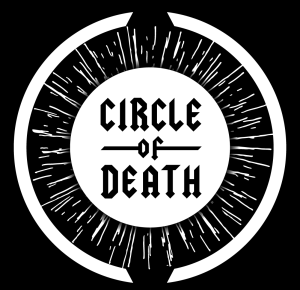 Davood is very glad to be a part of the family at Circle of Death Records and hopes listeners will find both enjoyment and inspiration from his many various works. Bio: After playing the drums and writing songs in multiple metal/hard rock bands In his 20’s, Family, Life and Work took a priority over band rehearsals and playing gigs. To fill the void of playing in bands and with the desire to keep creating music Tom Gent has self produced his first EP “Tactical Response Group” released on Circle Of Death Records in early 2018. Using an unconventional method of programming midi guitar and bass along with synth and key sections Tactical Response Group takes elements from various metal/hard rock influences and is the current reflection of Tom Gent’s musical tastes.